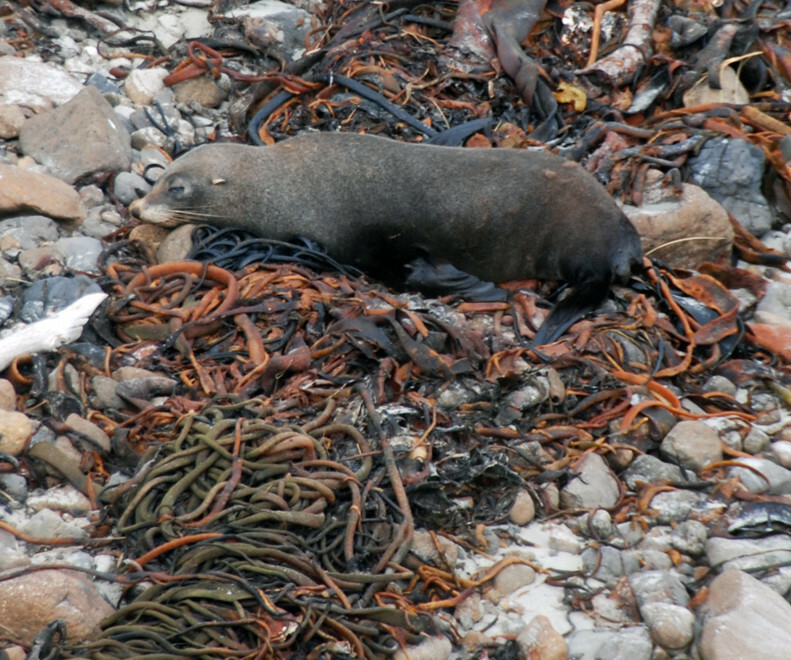 We saw seals at four places - the Otago Peninsula, Milford Sound, Stewart Island and Wharariki Beach. 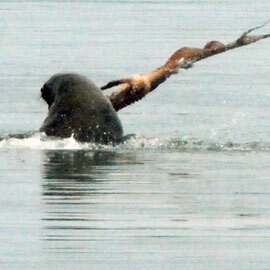 The mature and young female seals at Pilots Beach seemed imperturbed by our presence and that of another party. 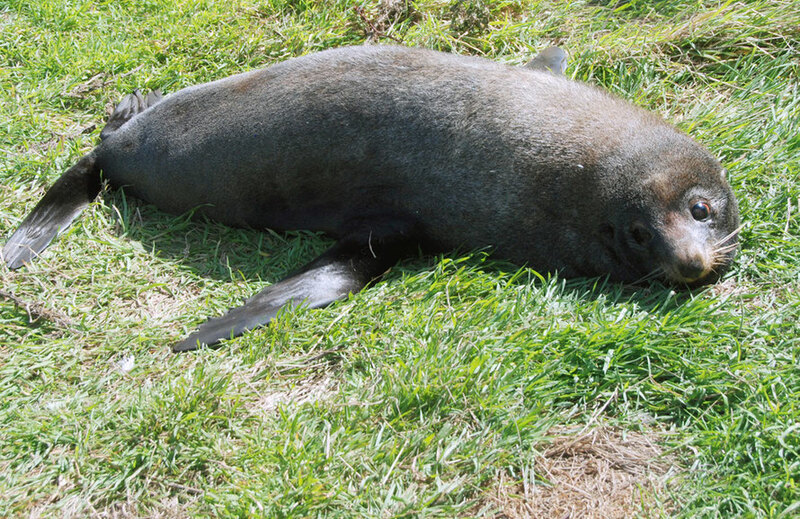 They had hauled out on a grassy bank and were enjoying the sun. 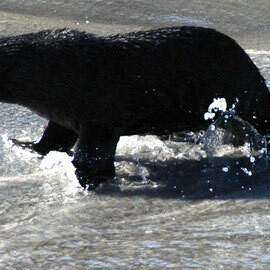 Their fur is finely grained and luxurious. 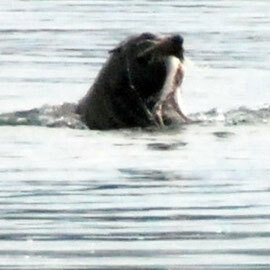 The white tips on the back-fur give it a beautiful grey sheen whilst the belly-fur is a lush tan-brown. 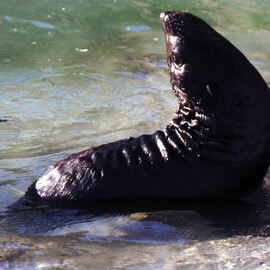 The pointy-nosed kekeno are distinguished by visible ears and flippers that can rotate forward. 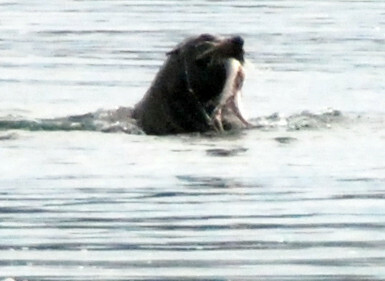 The current population is estimated at 50-60,000. 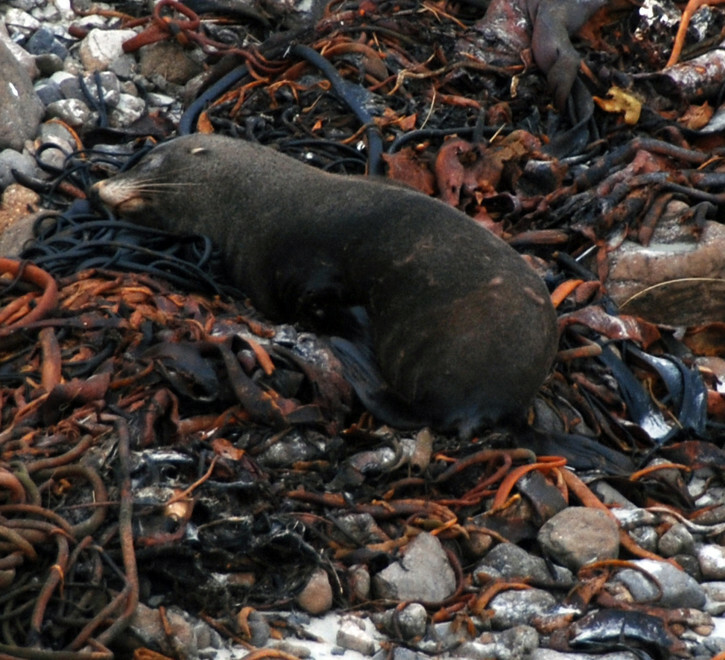 At Wharariki, to the immediate south-west of Cape Farewell at the northern end of the South Island, we were lucky to hit the beach at the right tide and got a fabulous display from some fur seal pups playing in a rock pool. 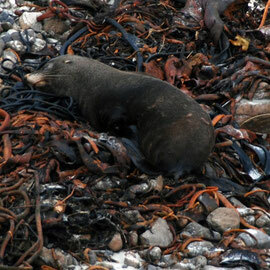 Wharariki Beach is a spectacular, windswept west coast beach. 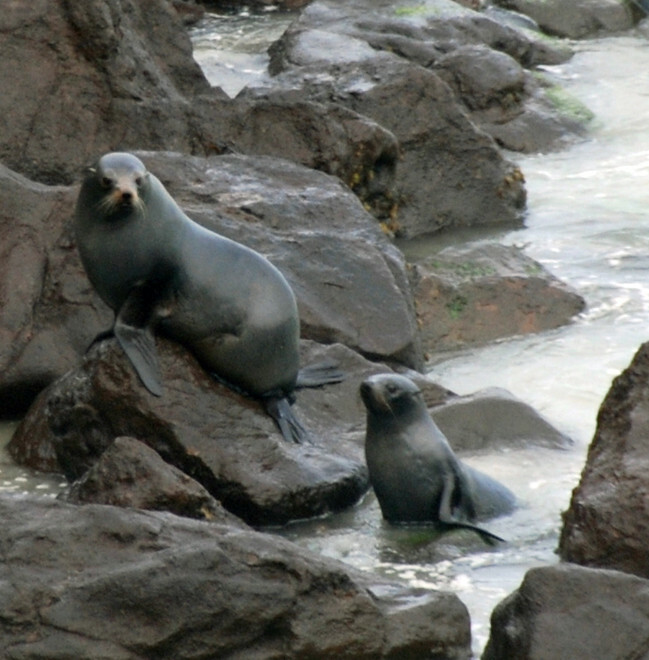 At the east end the steep hills of the Puponga headland are broken into three small islands that are accessible at low tide. Otago seals dive almost exlusively at night and their highly sensitive whiskers help them find their prey on long dives. 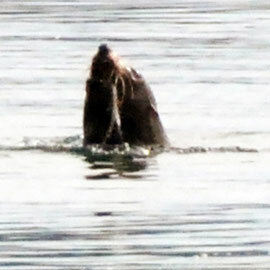 They can also close their nostrils. 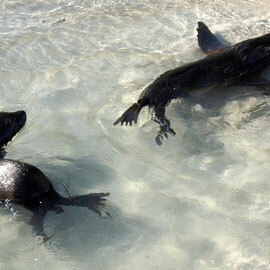 A tidal pool sheltered by the island provides an ideal playground for the pups. 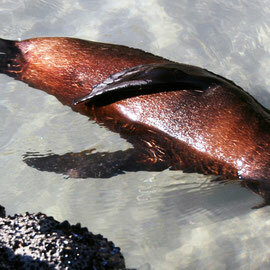 They swam with absolute consummate ease in the saltwater of the pool. 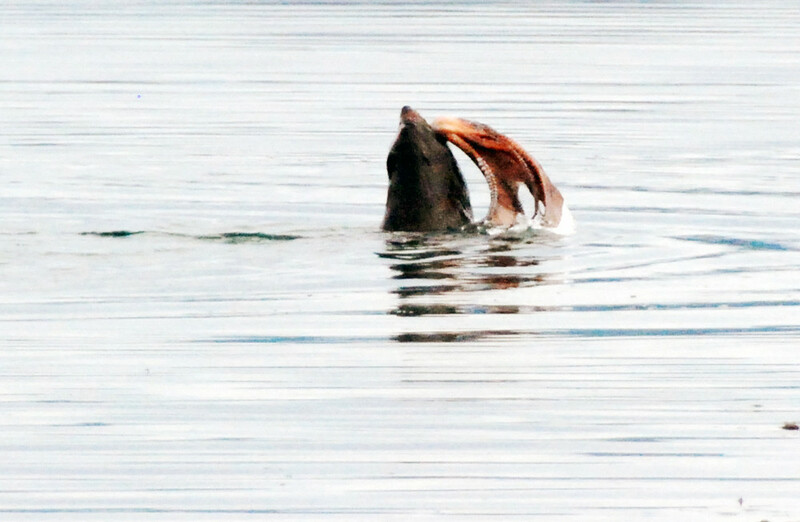 Their fur looked bedraggled out of the water, like a hesitant punk-rocker's hairdo, but when immersed it acted as a force-field to part the waters. 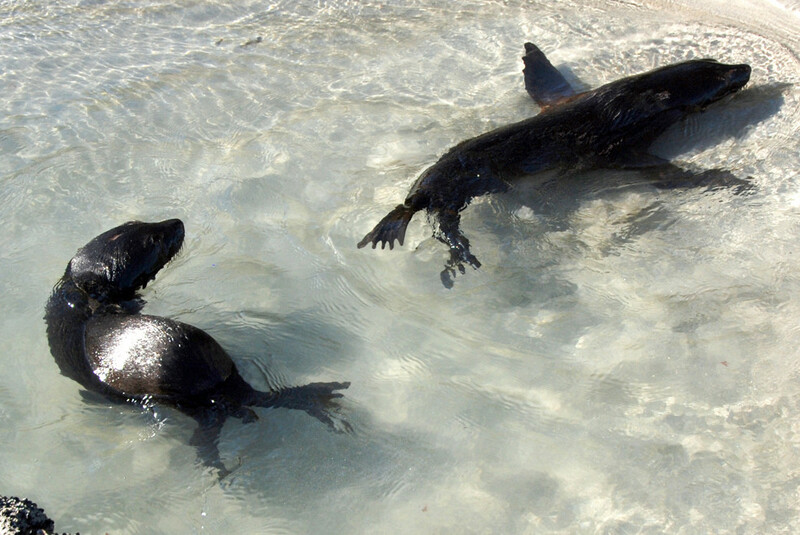 Every now and then a bigger wave would wash through the pool and the little pups would go tearing after it on their flippers while their mums looked on from a rock ledge behind. 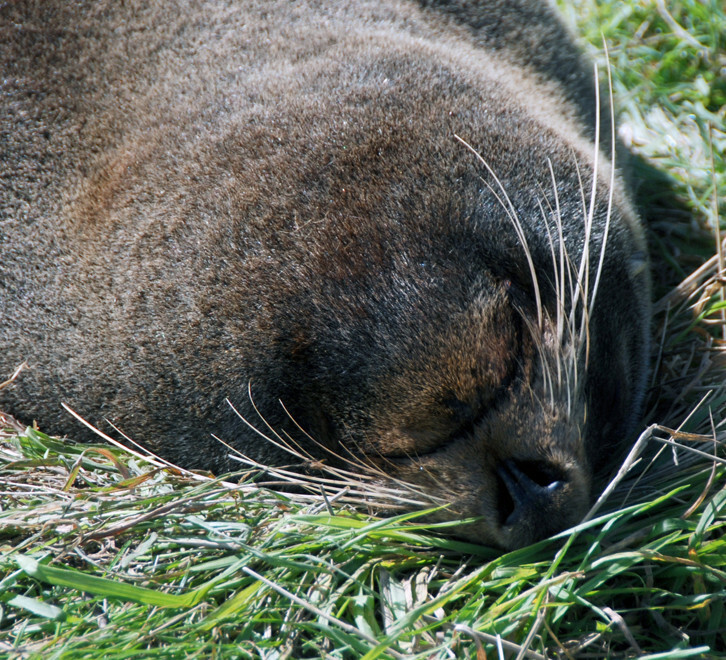 It felt somehow reassuring to be in touch with mammals that are actually indigenous to New Zealand and not considered a pest to be eliminated. 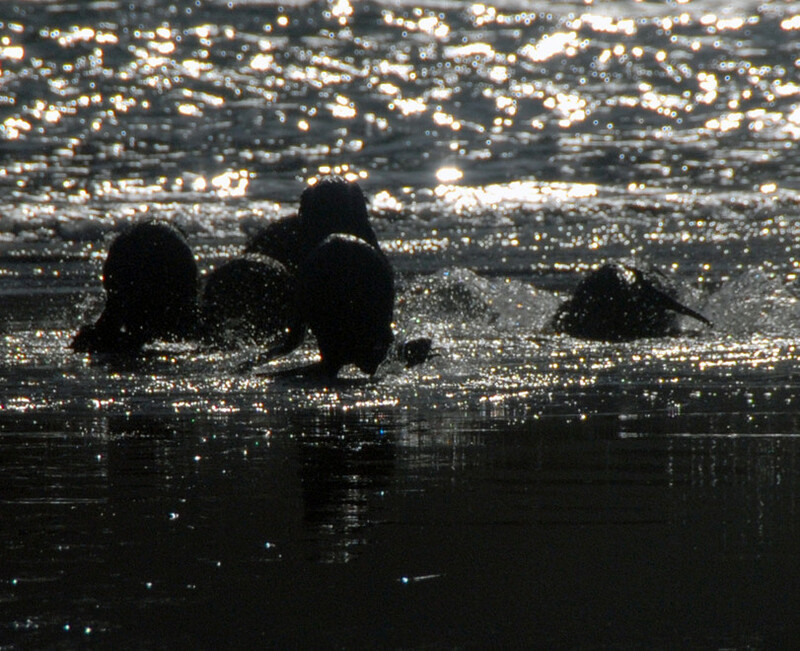 Black against the glittering water the seal pups would every now and then do a mad dash for the incoming waves. 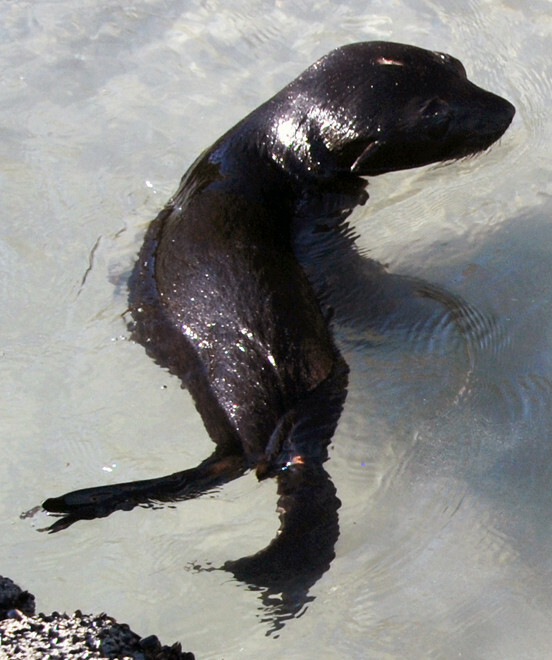 Fur seals are unique amongst seals at being able to run on their flippers. 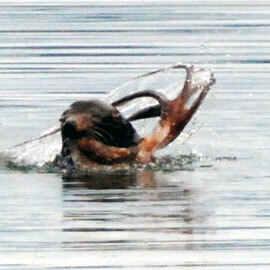 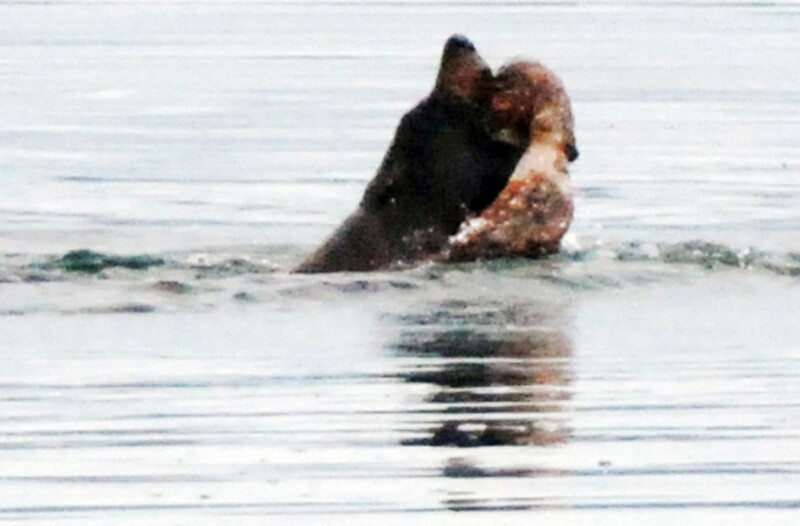 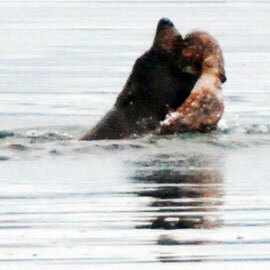 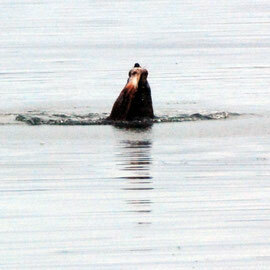 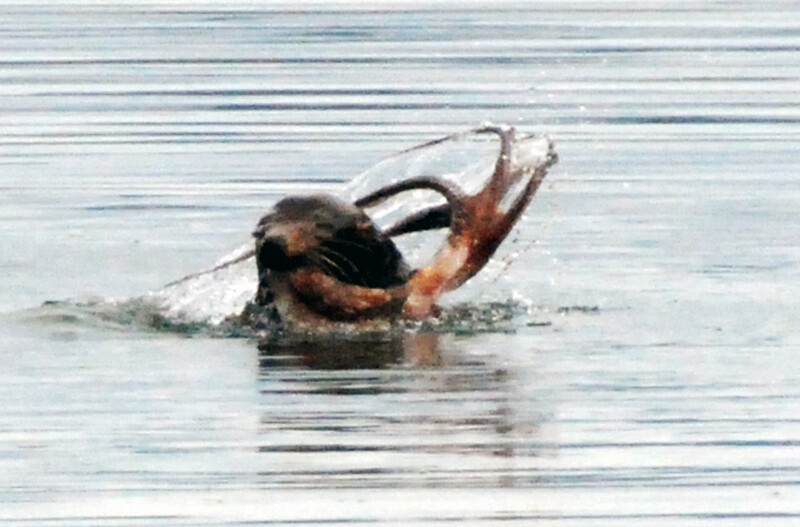 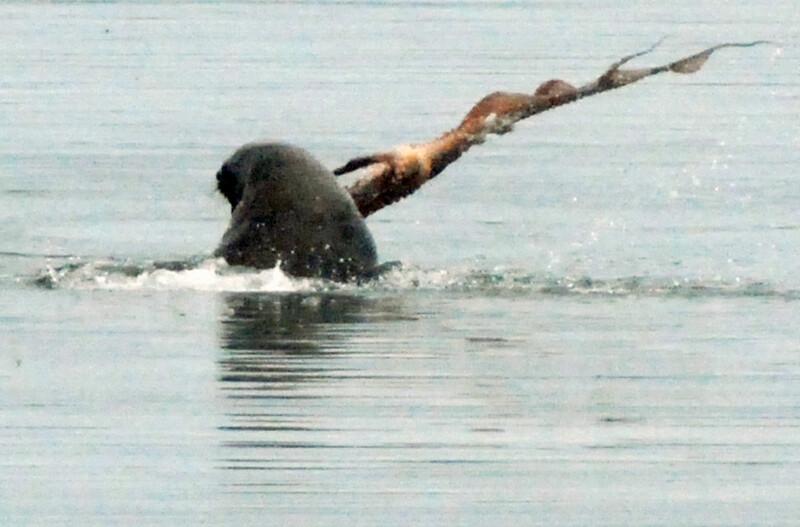 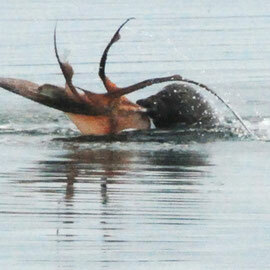 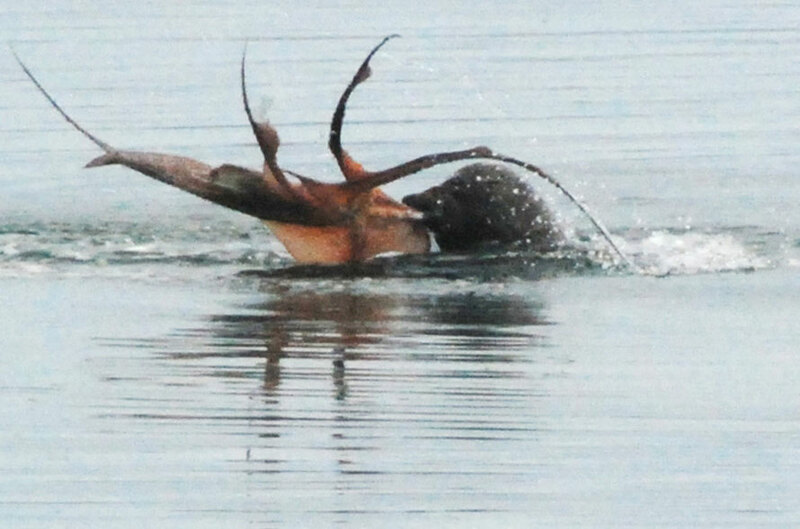 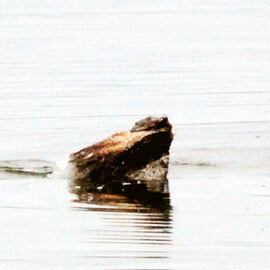 At Stewart Island we spotted a seal thrashing a squid in the water of West End Beach on the off-island of Ulva. 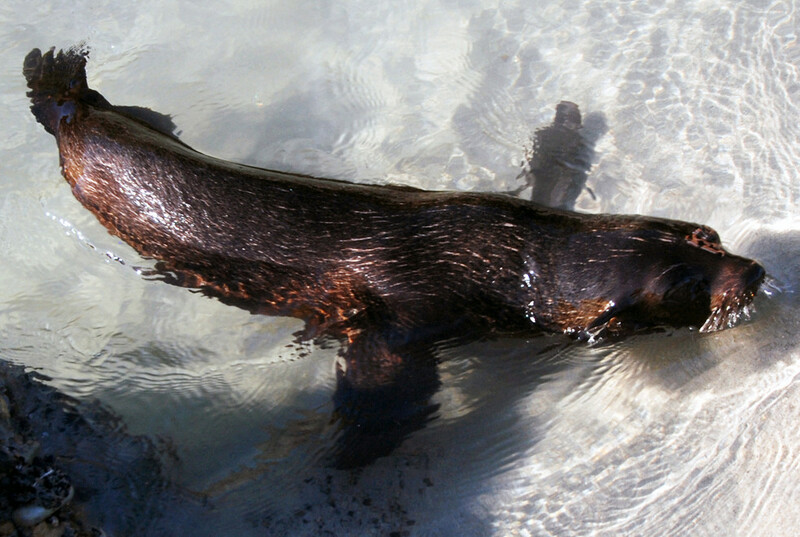 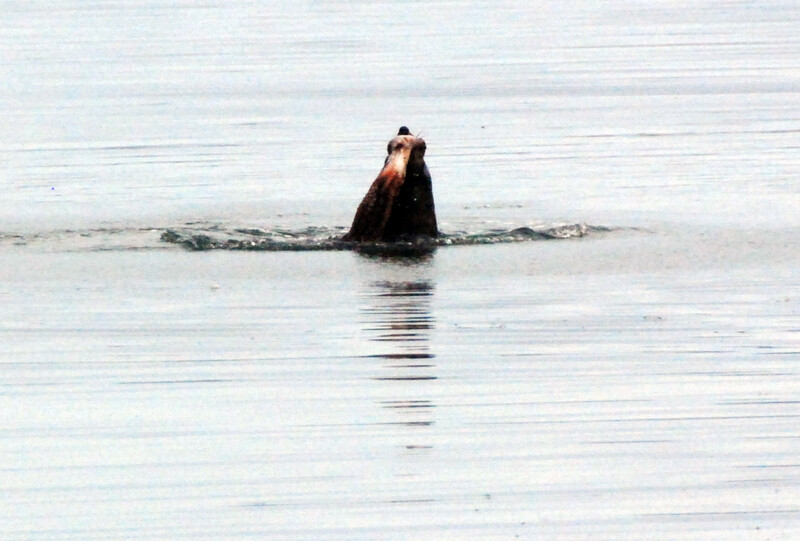 Fur seals can dive to great depths of 200m. 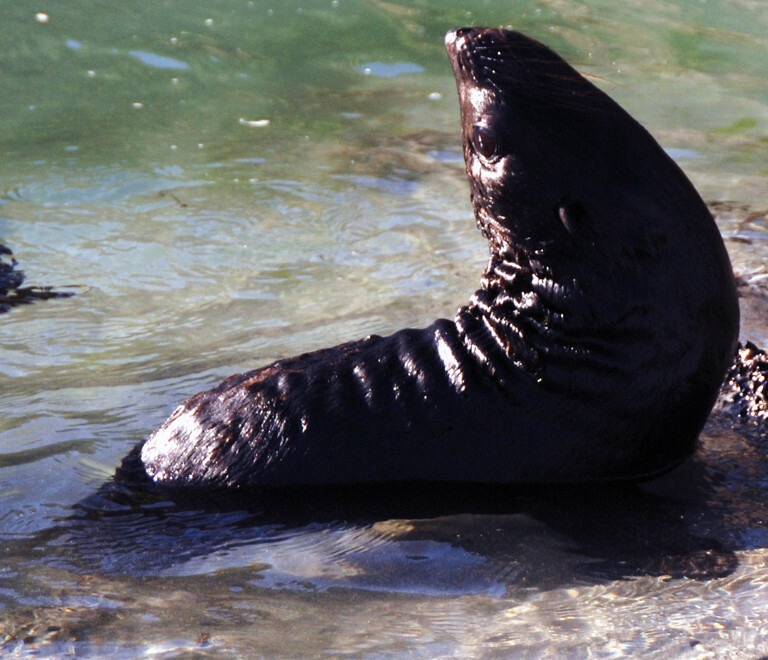 This is possible because in a seal’s muscles there are much higher concentrations of the protein myoglobin. 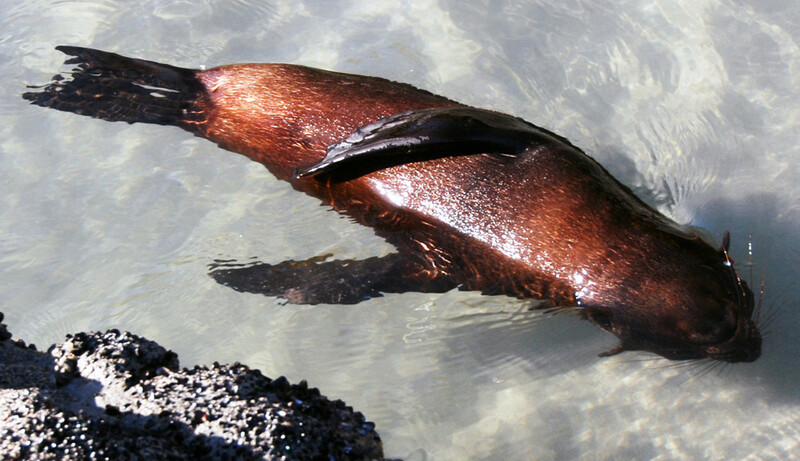 This protein can bind to oxygen and in effect turns muscle into an oxygen stores that can power the seal while it is diving. 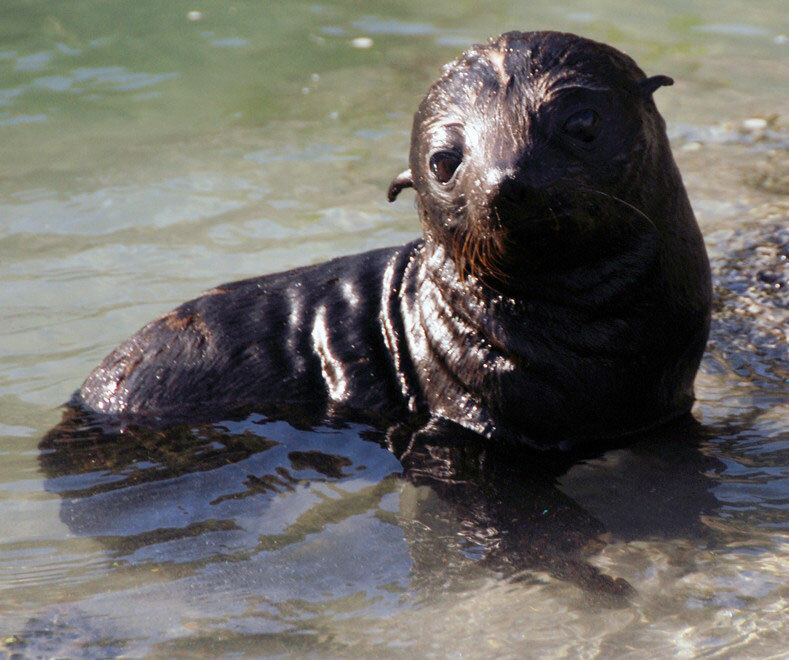 Seals also have more blood, a higher proportion of red blood cells, and the ability to reduce their heart rates while diving. 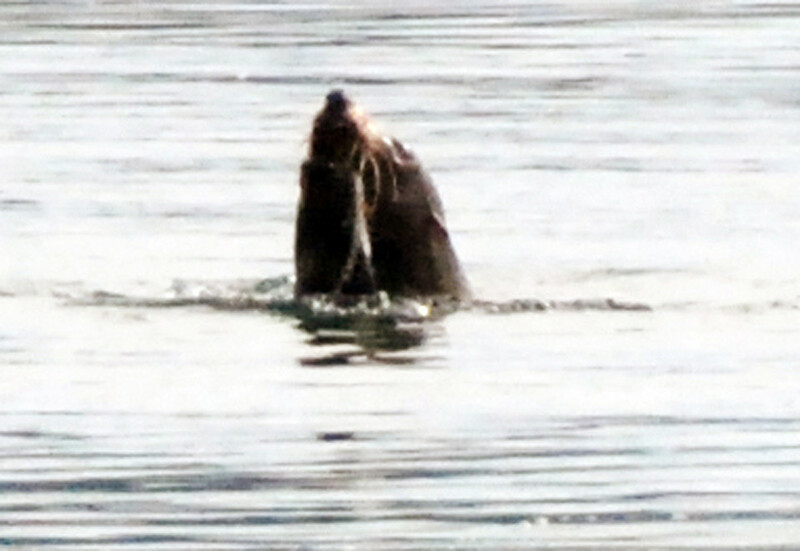 In order to avoid oxygen bubbles getting into the blood stream and causing the bends seals do not use any air remaining within their lungs once they have dived to about 70m. 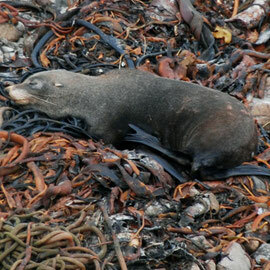 The lungs collapse, and the seal relies on oxygen stored in blood and muscle (see here). 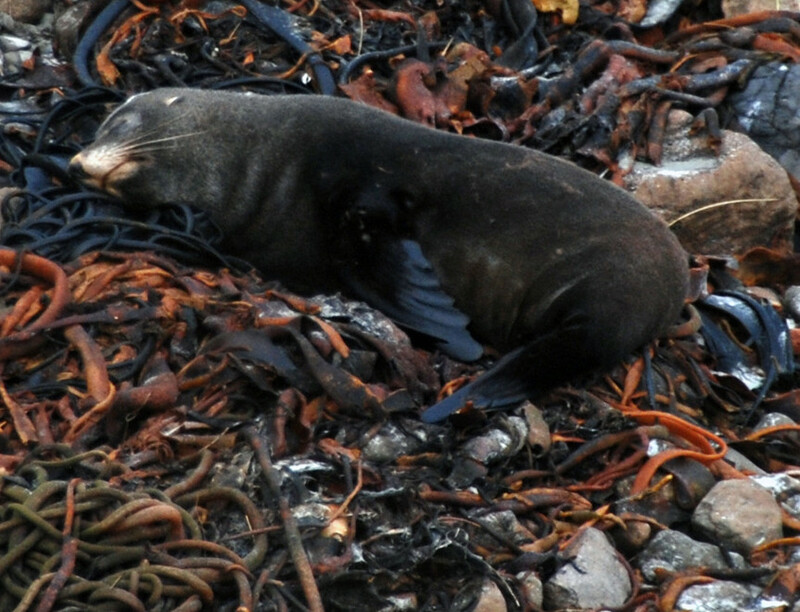 New Zealand Fur Seals – kekeno in Māori - have played an important role in the exploitation and settlement of New Zealand by both Maori settlers and European traders. 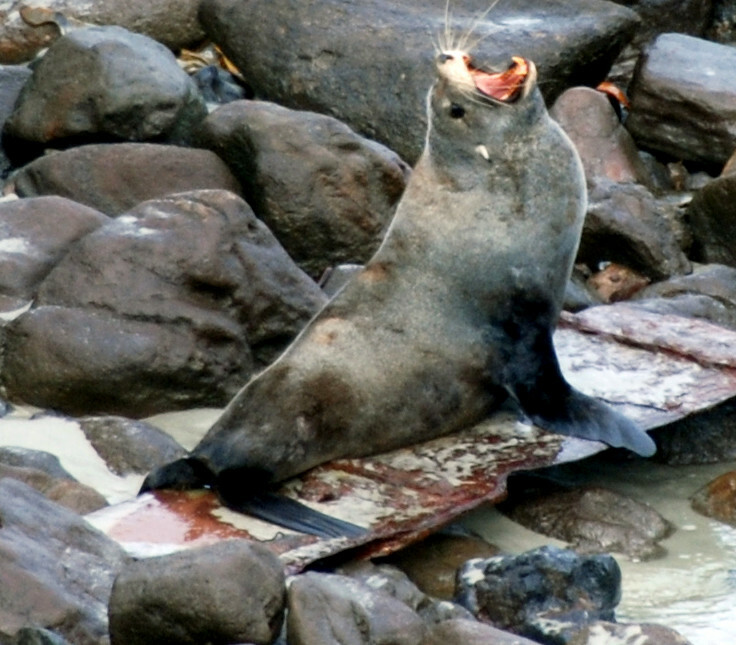 Early Maori are known to have hunted seals in large number from mobile camps in the first century of Polynesian colonization. 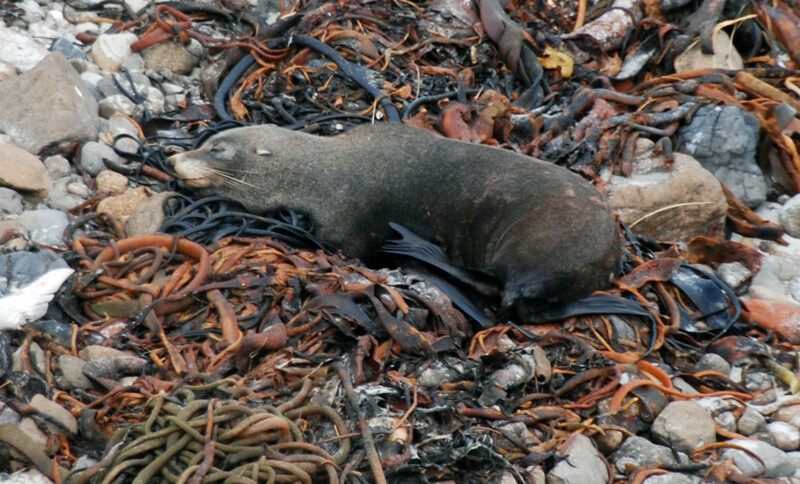 As with the decimation of the big flightless birds (Moa), this took a serious toll on seal rookeries apart from in the far south of the South Island. 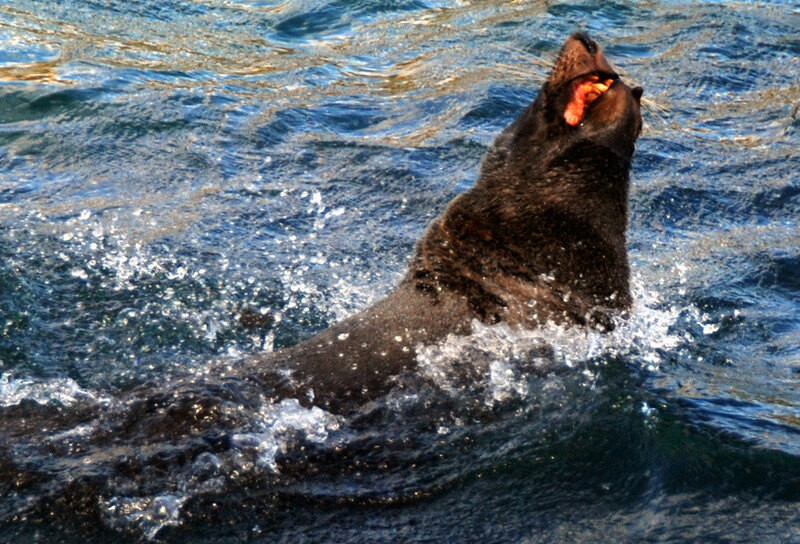 In terms of calorific value seals exceeded all other species (see King pp 64-66). 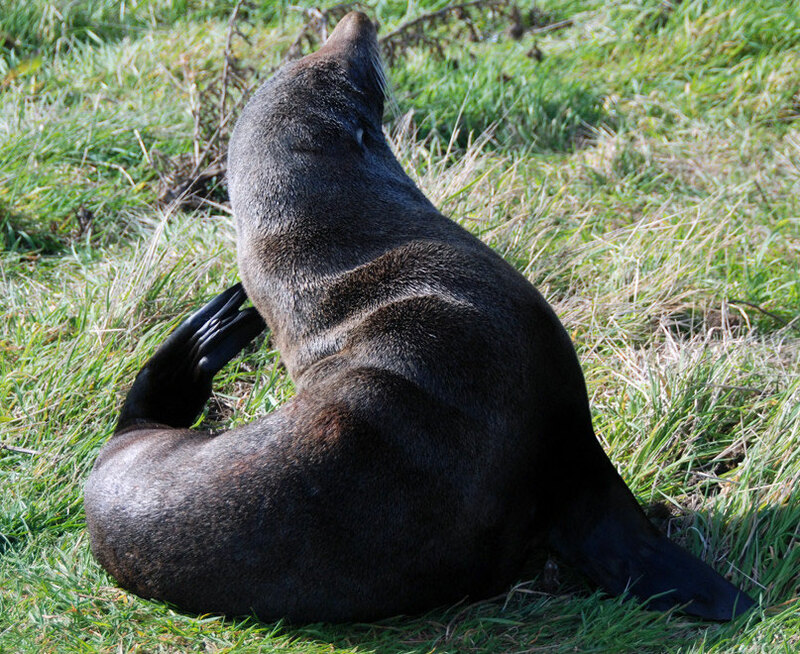 ‘It was seals in the south rather than timber in the north …that generated the first European commercial operation in the early 1790s.’ This was due to the acceptance of seal skins as payment for tea in Canton and Macau (opium was to be used later). 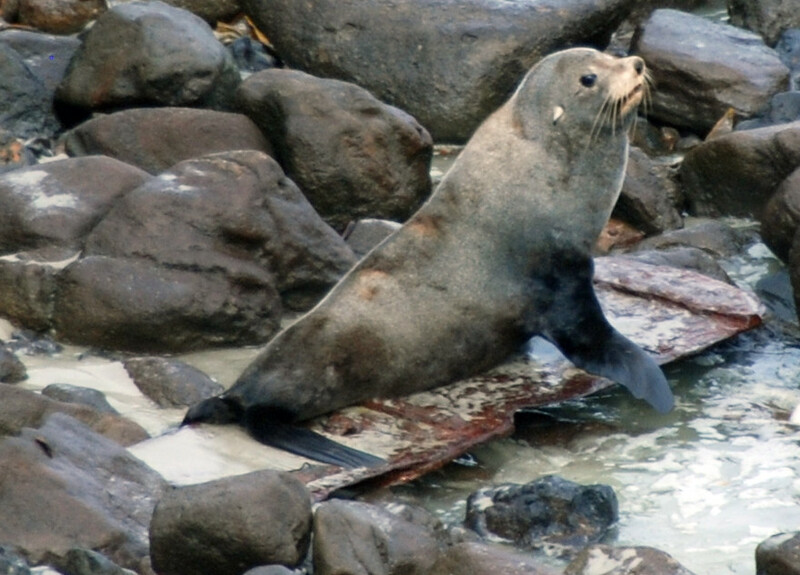 James Cook made known the abundance of the New Zealand Fur Seal (Arctocephalus forsteri) in Europe and 20 years later in 1792 the first Australian-based gang of sealers was dropped off at Dusky Sound on the south west coast. 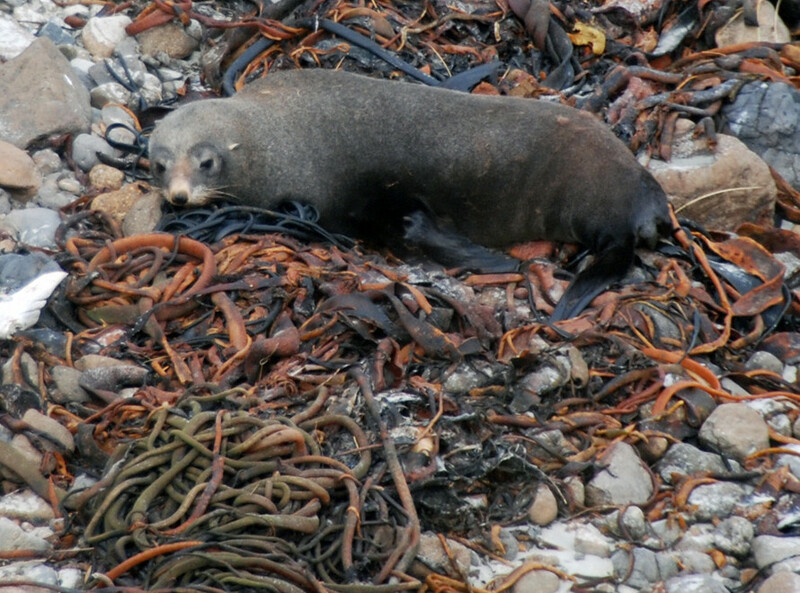 Two decades of intense sealing in Fjordland, the Foveaux Strait and Stewart Island followed. 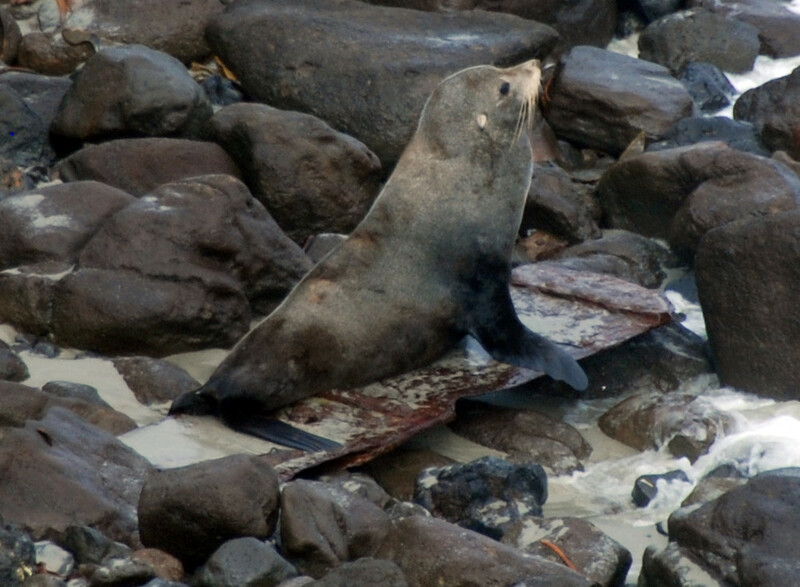 In 1805 the vessel, Favorite shipped out 80,000 seal skins from the Foveaux Strait. 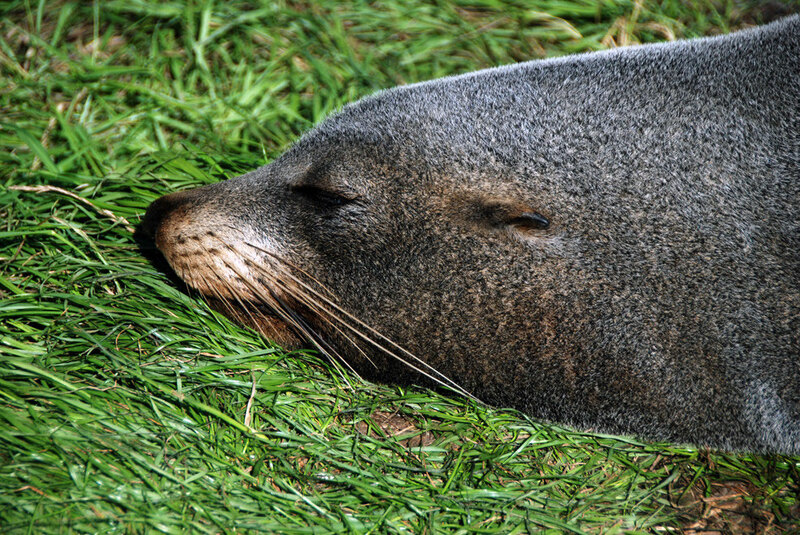 When the mainland seal were all but wiped out by indiscriminate slaughter and after sealers and Maori’s fought battles over seal rights near Otago Harbour in 1814 and 1817 on ‘Murdering Beach’ the sealers’ sites were set on the sub-Antarctic islands to the south east of New Zealand – particularly the Chatham and Antipodes Islands. 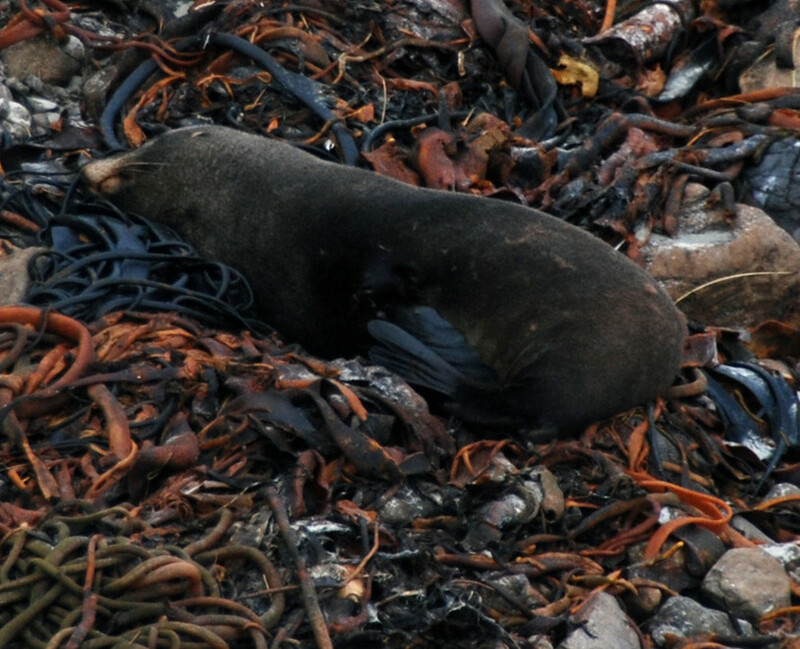 It took but a decade to wreak desolation there and the seal industry all but died out – with a brief resurgence in late 1820s. 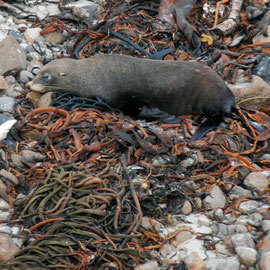 Sealing brought Maori and Europeans into close proximity with Maori working in the mixed gangs and disillusioned sealers joined the dominant Maori iwi in the south, the Ngai Tahu, to grow vegetables and supply ships calling at the southern ports (see King 2003 History of New Zealand 118 -121). 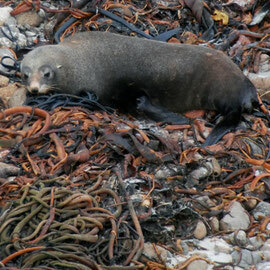 Having wiped out the seals attention then turned to whales and whaling. 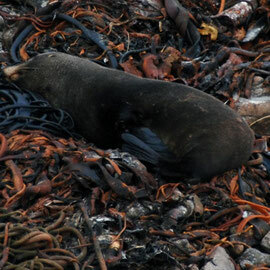 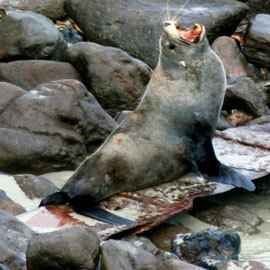 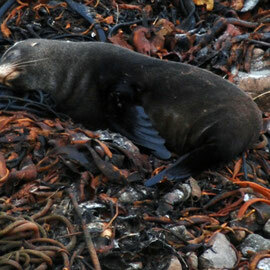 Commercial fishing still takes a toll of seals but in New Zealand they are now a protected species. 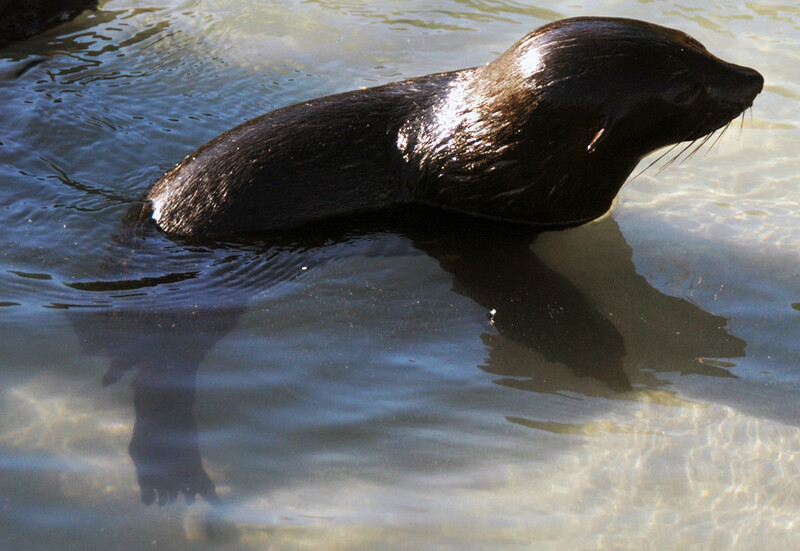 Fur seals have two layers of fur - the longer guard hairs and the shorter under fur. 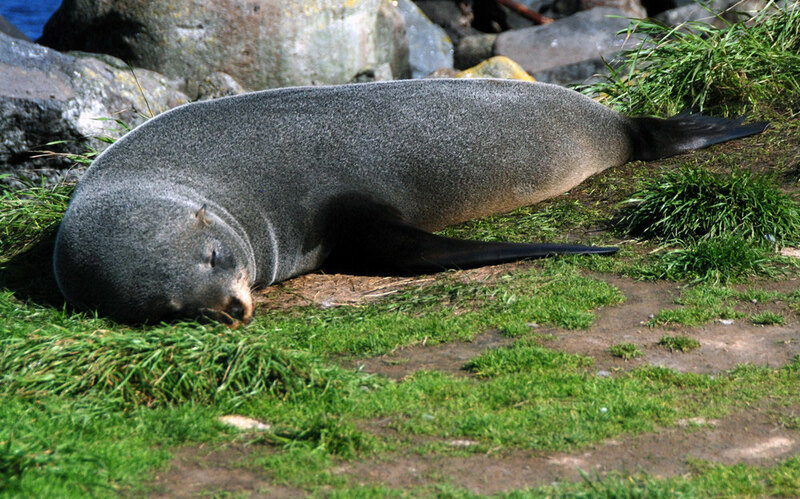 Fur seal pelts were used for hats, coats and waistcoats. 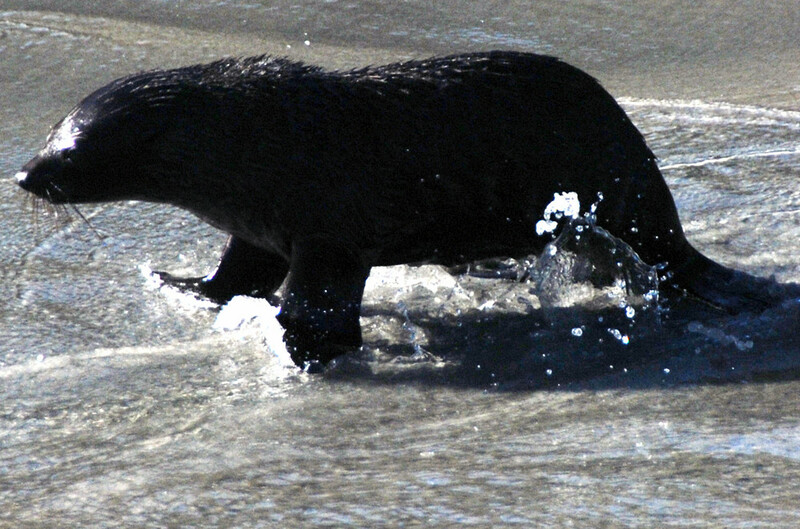 In the early nineteenth century a new way of processing the fur increased its desirability and led to a brief uptick in the price paid for pelts. 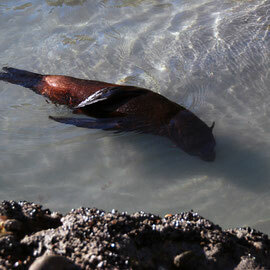 Fur seals are dimorphic - that is, the males are considerably bigger than the females. 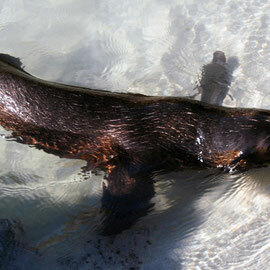 The males can measure up to 2m in length and weigh up to 150kg. 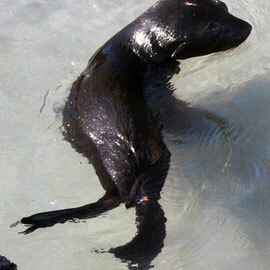 The females do not exceed 1.5m and weigh between 30kg and 50kg. 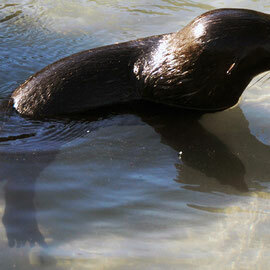 I have not found a good description of physical differences between males and females. 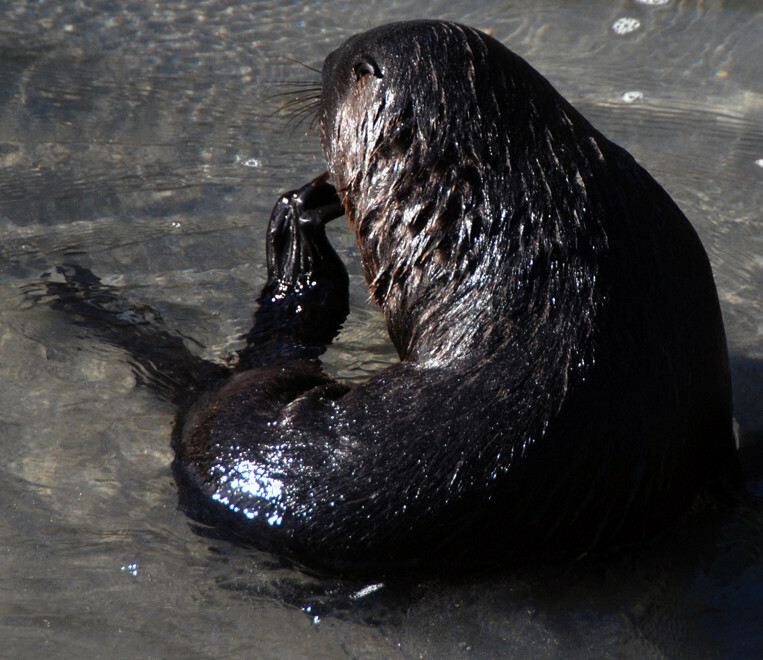 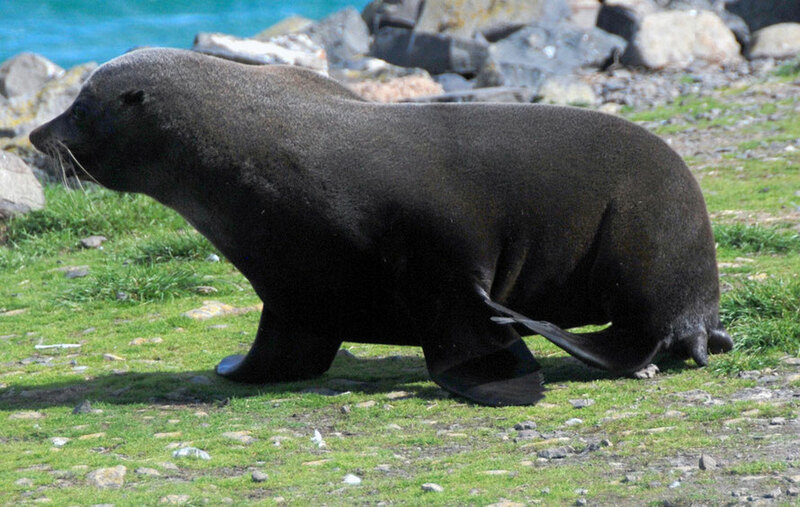 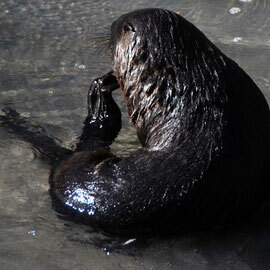 A picture on the Society for Marine Mammalogy website suggests that males are browner than females and have a more pronounced slope between forehead and nose and are generally more bulky, particularly around the shoulders and neck. 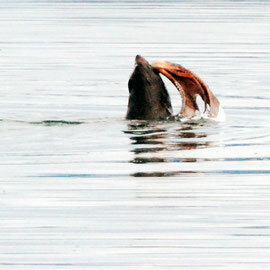 For these reasons I am inclined to think the seal below is a male but I am not really convinced. 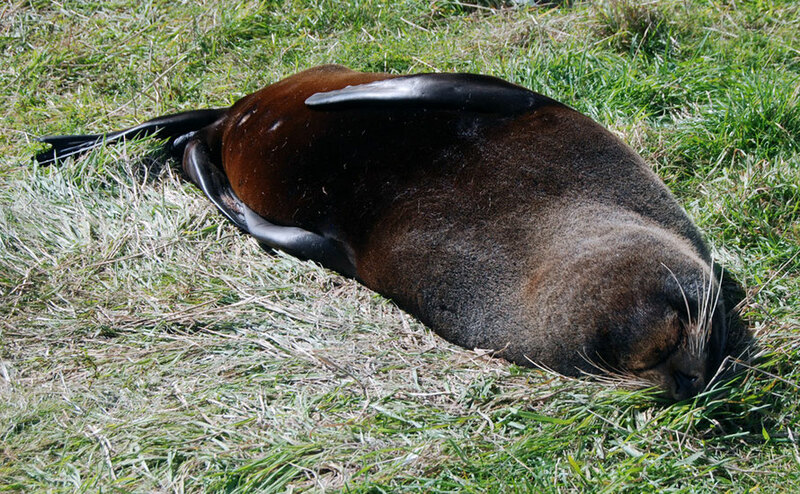 Unfortunately we didn't have a tape measure with us in New Zealand. 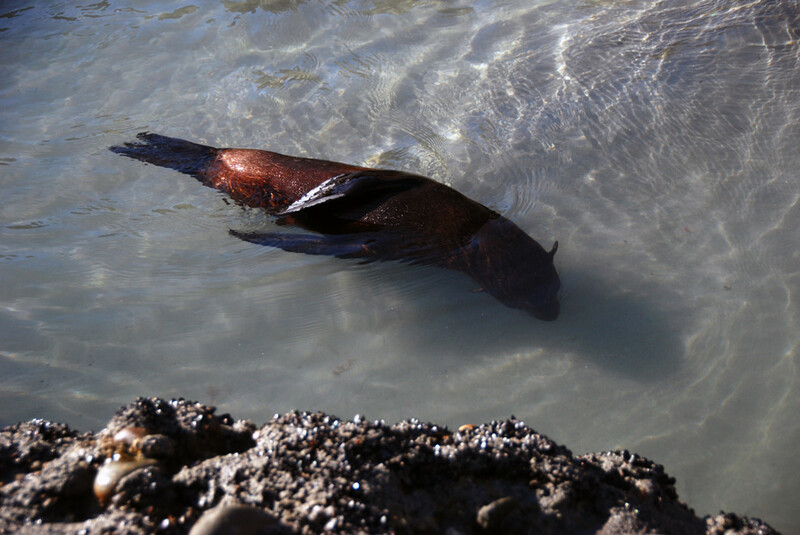 The scene of stretched-out bliss is actually incredibly functional for fur seals that need to recuperate after their deep diving exploits. Otago fur seals are known to dive almost exclusively at night for their prey of squid, jack mackerel, conger eel, barracuda and hoki (a type of hake)and they dive almost continuously from sundown to dawn. 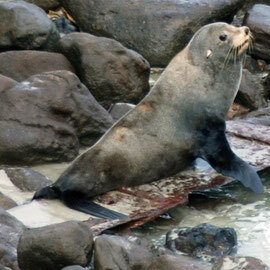 Female fur seals have been recording diving to depths of 238m and for a duration of 11 minutes. 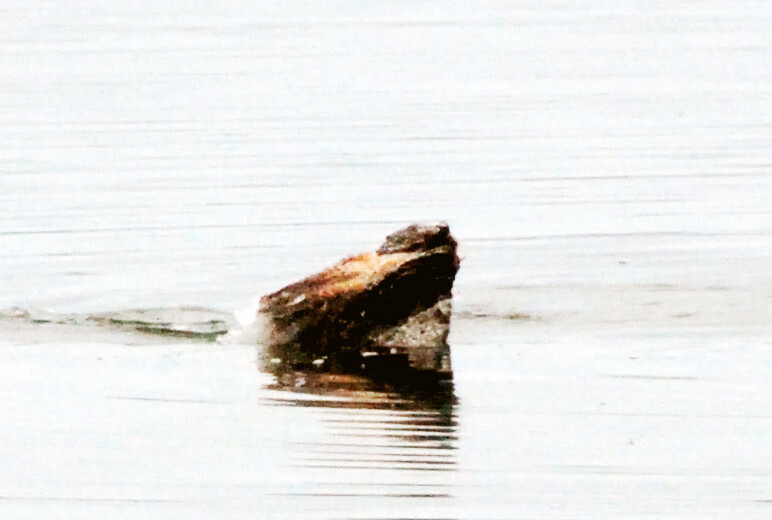 (see Department of Conservation here). 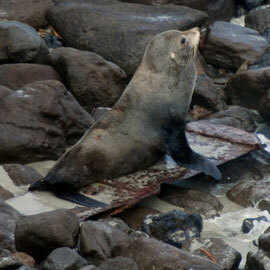 Female seal at Sand Fly Bay sitting on what looks like an old iron plate from a shipwreck.